For the transperson out in public, especially one that is not in formal transition, the question of which washroom to use is always a challenging one, with very rare exceptions. Consider that this is an issue for both M-t-F and F-t-M, though the risks and concerns are slightly different, they are nonetheless real and physical violence is only the most obvious of them. For me, it always great to find a place that just has individual "unisex" washrooms where you don't actually share. That reduces, or even eliminates the risks associated with it. However, this is uncommon and a lot of the advice out there is use the washroom according to how you're presenting. Hmm. 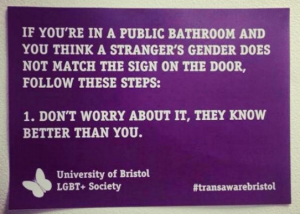 That leads me to this campaign from the LGBT community at the University of Bristol. I applaud the notion that they're trying to raise awareness of the issues transpeople face, this is quite important in my opinion, but I feel this message is a bit misguided. As noted quite ably on glosswatch, it's really not that simple as there are women who, quite legitimately, have concerns and fears about men and this should not be dismissed lightly or so cavalierly. Having said that, I'm not sure how that reconciles well with F-t-M who might use the women's washroom as a result of that view. A male-seeming presence is still a male-seeming presence, I would think. In any event, there are members of our community who are in transition, in either direction, under medical supervision, and I think there's room to accommodate them, but for the rest of us in our wide ranging community I think it warrants some additional consideration and respect. I don't know that I have a solid answer to that, but I think it talks to where you are. For example, there are bars in Toronto that cater to the LGBT community and have a much more open policy in place, and that's expected by all who go there, so you use as presenting. However, there are places that are not like that and then sound judgement, consideration, and real respect is necessary. So, yeah, I have mixed feelings about this message. Still, it ignites the discussion about this issue and calls attention to some real challenges out there for all of us on the gender spectrum. If nothing else, that's a good thing. Maybe, someday, we won't have these fears and issues dogging our society, but I think, quite sadly, that's still a long ways away.